Part of the Nawab Vizir's marching Equipage. Oct. 1814. Fish-shaped car. bl.uk > Online Gallery Home	> Online exhibitions	> Asia, Pacific and Africa Collections	> Part of the Nawab Vizir's marching Equipage. Oct. 1814. Fish-shaped car. Pencil drawing of a fish-shaped car of the Nawab Vizier of Lucknow by Robert Smith (1787-1873) dated October 1814. 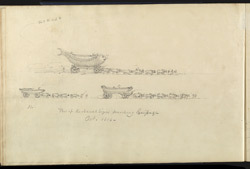 This is one of 27 drawings (29 folios) of views made during a march from Benares (Varanasi) to Bareilly in Uttar Pradesh, probably en route for Almora in 1814. Inscribed on the original cover is: 'No. XIII. Ganges & Luknow'. Captain Robert Smith was a military engineer with the East India Company and was in India from 1805 to 1833. He designed a number of buildings in India and also repaired various Indian monuments including the Kutb Minar and the Jami Masjid at Delhi. Lucknow, situated on the banks of the Gomti River is the state capital of Uttar Pradesh, northern India. The city came to prominence under the Mughal Emperor Akbar in the 16th century. In the 18th century it developed into a flourishing centre for the arts under the patronage of Nawab Saadat Khan Burhan-ul-Mulk, a Persian courtier who founded the Oudh Dynasty. In 1775 Nawab Asaf-ud-Daula moved his capital here from Faizabad. The fish was the ancient symbol of sovereignty that came to be associated with this dynasty and later rulers that became Nawabs.